About one-third of the world's population currently lives under pluri-legal systems where governments hold individuals subject to the purview of ethno-religious rather than national norms in respect to family law. 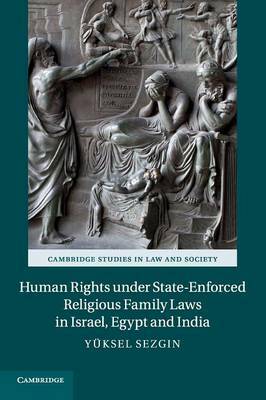 How does the state-enforcement of these religious family laws impact fundamental rights and liberties? What resistance strategies do people employ in order to overcome the disabilities and limitations these religious laws impose upon their rights? Based on archival research, court observations and interviews with individuals from three countries, Yüksel Sezgin shows that governments have often intervened in order to impress a particular image of subjectivity upon a society, while people have constantly challenged the interpretive monopoly of courts and state-sanctioned religious institutions, re-negotiated their rights and duties under the law, and changed the system from within. He also identifies key lessons and best practices for the integration of universal human rights principles into religious legal systems.